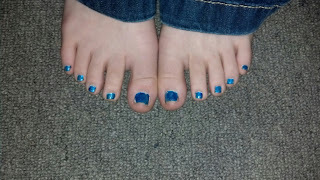 My granddaughter sent me these picturess of her take on "Light It Up Blue For Autism". I was thrilled she was participating in this event that means so much to me! 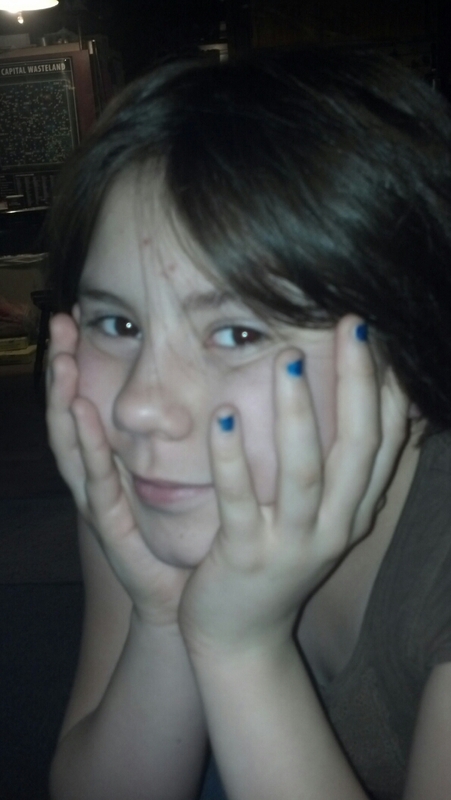 She said when she grows up she wants to be a research scientist and find a cure for autism. This would be a dream come true for me and for my grandchild to make such a discovery, would be even more awesome. Thank heavens these days a girl can be whatever she wants to be and/or aspires to without having to hear "that is not a job for a woman"--She is still young but I sincerely hope that if she wants to be a research scientist that she goes for it and becomes one! I love it! I find it very inspiring that she wants to find the cure. I am sure you are so proud of her. Oh, that's a nice tribute for Autism days. Me and daughter recently did this too. She has a very kind heart, caring for those who has the autism. I wish her all the luck, hope she will achieve her dreams to become a research scientist! Fantastic color! I love how involved your children are in this movement. Way to go! So glad to see people of all ages get in on this fun awareness trend! What a sweet little girl!So glad to be a part of light it up blue!!! You have a very special granddaughter! Im sure she will succeed!